LeBron James must beat the Celtics to continue his journey toward a proper legacy, but he can't actually win against Boston ... all because of 2010. Follow , and Like SBNation.com on Facebook. 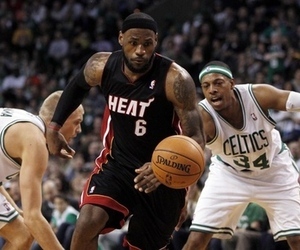 May 28, 2012 - The Miami Heat tip off against the Boston Celtics on Monday evening with the Eastern Conference title on the line. Neither team is at optimal strength, but at least the Heat looked like a legit title contender in the second round. The Celtics were fortunate to survive a semifinal series against the Philadelphia 76ers that can only be described as a fly-infested picnic table outside of a terrible taco stand in the desert in the dead of summer. We can all appreciate deft defense; what Stephen Jackson did to Kevin Durant on Sunday morning was artful, even. But Celtics-Sixers? That was just straight-up slop most of the time. It was ugly basketball, played ugly. Understandably, Miami is heavily favored entering the East finals, even without Chris Bosh. While the Heat struggled to eject the Indiana Pacers, they did handle it, winning on the road to finish it off in six as Dwyane Wade had a mammoth night. Against Boston, though, the cameras will shift back toward LeBron James, the alpha and omega of the Heat, the NBA and really, the sporting world. LeBron's personal struggles with this Boston team are seemingly the sole source of hope among Celtics faithful and King James haters alike. If The Chosen One gets a little tight against his eternal foe, maybe the Heat will choke. Maybe the Celtics will be back in the NBA Finals for the third time in the Big Four era. Maybe the next banner will be raised at The Garden, and maybe LeBron will be left scratching his dome for one more year. It's funny that, according to the common narrative, only Miami's psychology can fell Miami; there are a couple of match-ups that favor Boston, such as point guard, where no one on the Heat can stick with Rajon Rondo. And ... well, maybe that's it, especially if LeBron matches up on Paul Pierce and Kevin Garnett frequently. Boston's offense is so poor, so unreliable that if James, Shane Battier and Joel Anthony can close off offense from those two Celtics, Boston might struggle to hit 60 every night. That one series has to some extent defined LeBron and the Celtics. The unfortunate thing for James is now there's almost no chance of reclaiming the memory and spinning it into a new branch of The Chosen One's narrative. Boston is broken, Wade is in the wings, and if LeBron can't destroy the Celtics in 2012, the narrative douses itself in kerosene and burns forever. If LeBron shreds Boston as we expect him to ... well, we expected him to do that. Look at them! They are awful right now! LeBron won't be melancholy to see the Celtics go, because they have no potential positive purpose in his narrative any longer. He can't win against them -- he can only begin untangling a mess partially of his own creation by winning a title, which necessarily comes with triumph over Boston but also requires that messy reality of beating the Spurs or Thunder. It's funny that The Sports Fan Journal uncovered that marvelous clip of Pat Riley chatting with a pre-ring Michael Jordan this week: In the analogy, the Pistons are Boston, and MJ is LeBron. And MJ, the ever-impossible measuring stick, is on record saying that he a) wants a title more than anything and b) wouldn't feel his career would be tarnished without one. Mike, of course, went on to win the next six in which he played a full season. Didn't LeBron talk about wanting seven? Beating Boston won't get them there, but it'll make sure he's on the road to No. 1. There's nowhere else to start but there. The Hook is an NBA column by Tom Ziller. See the archives. I write about the NBA for SBNation.com and the Kings for Sactown Royalty. I live in Sacramento, love freedom and wish that taco truck would just get here already.